How many of you cooks are often stuck in the kitchen alone while your family or dinner guests are having fun in another room? I’ve learned over years of entertaining that it’s more fun to incorporate the cooking process into the party. In other words, bring your guests into the kitchen to visit with you while you cook or to help in the process. A bottle of chilled chardonnay usually does to trick to lure them in. I have a few friends who are avid cooks, but often I’m drafted to be in charge of the kitchen. My friend, Kevin, a very proficient cook, albeit a little insecure about his skills has prepared some delicious meals for us. He figured out years ago that if he asked my opinion on whether something was done on the grill and then went inside for something, I would take over and finish the cooking process. A little manipulation, perhaps?? I don’t fall for that anymore, but we get a big laugh when I call him on this tricky tactic. Our good friend, Dan McFarland, came over this week for a night of cooking and drinking wine. Dan has mad kitchen skills, and we share very similar cooking styles. I was excited to share the kitchen with an equal in culinary talents. 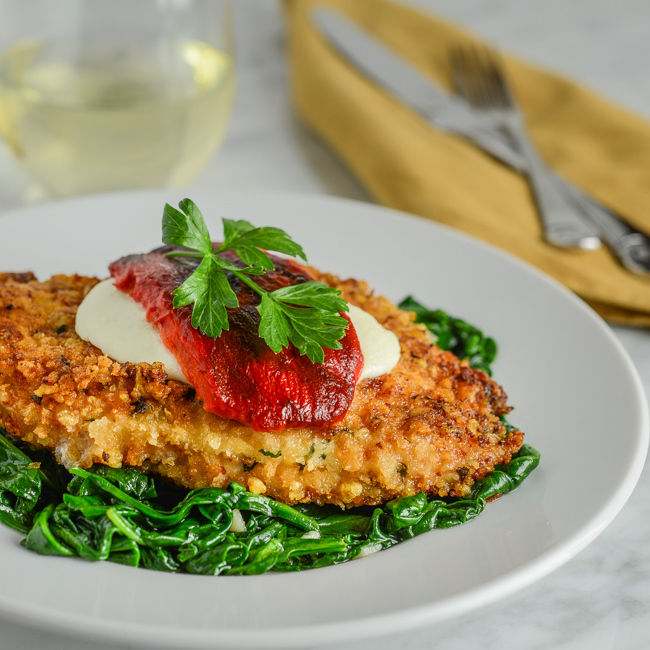 Dan suggested a breaded chicken breast stack with spinach, roasted red pepper, and fresh mozzarella so we were off to create a beautiful and delicious meal. Between glasses of wine and in depth conversation, dinner was a little late, but who cares? Cooking with a good friend was the point of the evening and in my opinion it was just about the ideal way to spend a weeknight. 1. Preheat oven on the broil mode. Transfer bell peppers to a baking sheet and place under broiler. Broil for 2 to 3 minutes on each side or until peppers are soft and skin is turning black. Remove from oven and cool completely. When cooled carefully remove skin. Cut in half and remove stem, ribs, and seeds. 2. Combine panko, cheese, 1 clove minced garlic, parsley, and 1/4 teaspoon salt, and black pepper in a medium bowl. Transfer mixture to a shallow container. 3. Place chicken breast between two sheets of plastic wrap or in a 1 gallon food storage bag. Pound with a kitchen mallet until breast is about 3/4 thick. Repeat for addition three breasts. 4. Place chicken breasts in bread/cheese mixture and press to coat. Transfer to baking sheet and sprinkle on additional bread mixture and press onto chicken, assuring breasts are completely coated. 5. Preheat oven to 400 degrees. Heat 4 tablespoons olive oil in a large non-stick or cast iron skillet over medium high heat. Place chicken breasts in skillet and cook for 3 minutes on each side or until golden brown. Add additional olive oil if needed. Spray baking sheet with cooking spray. Remove chicken from skillet and return to backing sheet. 6. Top each breast with a slice of mozzarella cheese and place baking sheet in the oven. Bake for 5 to 10 minutes or until internal temperature reaches 165 degrees. Cooking time will vary according to thickness of breasts. The last 2 to 3 minutes top each breast with 1/2 roasted red pepper. Remove chicken from oven. 7. While chicken is in the oven, heat 1 tablespoon olive oil in a medium skillet over medium high heat. Add 1 clove minced garlic, spinach and 1/4 teaspoon salt. Toss with tongs until spinach is just wilting. Remove from heat. 8. To assemble, divide spinach among 4 plates. Place chicken breasts on top of spinach. Garnish with parsley leaves and serve immediately. Cooking with friends just seems to make the food taste better – or maybe that’s just me…BTW, this garlic and parm and parsley bread coating is so gonna happen – in my kitchen this weekend! LOVE it – thanks for sharing Bill!! Cooking with friends is fun, isn’t it? We always enjoy that. And what a great dish to share with friends! This is inspired — thanks. Oh I totally agree Bill! Bobby and I both LOVE spending an evening in the kitchen with friends that have the same love of cooking and food that we do! Love this dish that you and your friends came up with! Bet it tastes as good as it looks. What wine did you serve with this? Thank, MJ! This dish is definitely a keeper. I think we were having Chardonnay that night. Cheers! I love this technique of pounding out chicken breasts and coating them in seasoned bread crumbs, cooking on the range and then finishing in the oven. Your Parmesan version looks delicious, and there are so many other variations that you can make with this technique. Like you, I love to keep it simple when I have friends over for dinner. Thanks! Love the appearance of your site, BTW! Thanks so much for dropping by, Susan! You are right in that this technique can be used in a variety of ways. Parmesan chicken is my favourite comfort dish! Love the spinach and roasted pepper, so good! Thanks for dropping by SBD, Jess! This sounds like a brilliant dinner idea! Very few of my friends will cook for me. I have to figure out how to make that happen more often. This looks way too delicious!